Okay, Why did They Do this? Well personally, (and I’m SURE not a lawyer), I think it’s a legal maneuver in response to the legal brief filed last week by Njoy’s lawyers, pending the appeals court hearing on September 23rd. 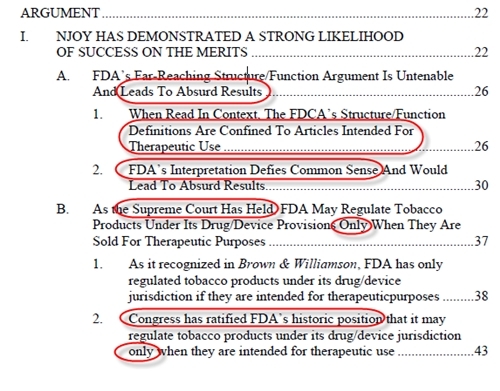 Remember, I wrote about the FDA loss in January? To refresh your memory, this is the “scare video” that the FDA produced last year around the time they began seizing shipments from China. In the video, there’s some guy on a home spun YouTube video that says “they’re healthy”. What a dumbass, huh? 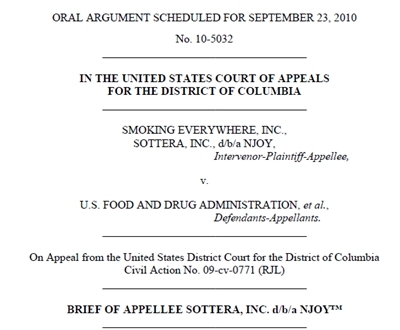 Now they’re coming back for more, and we here at Electric Nicotine have obtained a copy of the brief filed by the attorneys of the plaintiff. I think that by sending out these letters, the FDA is trying to make a case that they WERE being marketed theraputically, so they DO have the right to regulate them! I’m not sure how that equates with the stance that ALL electronic cigarettes have taken publicly, that they’re *NOT* a “quit smoking” device, but the lawyers seem to have the time, and our government seems to have the money to try and stop us from vaping. If you’re afraid that you may not get to try one of these before the government takes them away, then get an Ecig sent to you today for just $10.